So I'm done with my wedding ceremony 2 months ago, but the season for weddings is still far from over. So far I've received numerous wedding invitations almost every other weekend. 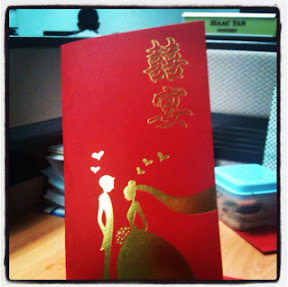 Today, I just received yet another "red bomb" from my colleague for his wedding early next month. Why do we call a Chinese wedding invitation the "red bomb"? Well, it's like a bomb being unleashed on you because each wedding dinner you attend or cannot attend has to come with the mandatory "Ang pao". Many good wishes to my colleague, and everyone who just got married or is going to get married soon! Happy marriage life. So I was at Sausagefest the other day with a bunch of other friends for their charity event brought together by the band "A sausage named Bob" and Smart Society, an arts school for the underprivileged. I don't have a habit of having heavy meals for breakfast when I'm at work, but once in a while there comes a time when I just want to indulge myself in some early morning breakfast. Just opposite my work place is this restaurant called D'Klasik serving Malay dishes. 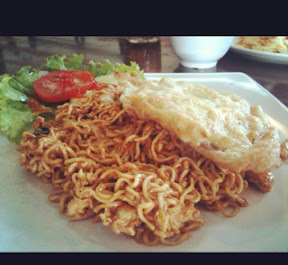 Well this morning I had the urge to order their Maggi Goreng. To complement the Maggi Goreng I ordered their "Telur dadar". Check out below on what I had this morning. The price came up to be RM5.